I made a quick multipurpose road trip to Melbourne via a short detour through the Wimmera Mallee in mid-March (13-19th). I wanted to reconnect with the Mallee Routes project; to spend time with my sister at Safety Beach; continue photographing around Nth Melbourne; check out the world of photobooks at both the Melbourne Art Book Fair and the 2018 ANZ Photobook Awards; and have a look at some possible gallery spaces at Abbotsford Convent to continue to exhibit the ongoing collaborative Melbourne drosscape work with Stuart Murdoch. For the drosscape work I had caught the Metro train to the Nth Melbourne railway station from Frankston. I then walked around Nth Melbourne with the 5x4 gear in a supermaket trolley for 5-6 hours--the gear is too heavy to carry. I initially walked along Laurens St, down Arden Street, then made my way along the Moonnee Ponds Creek Trail, which is part of the Capital City Trail. However, the promised cloud cover had gone, and the light in the mid afternoon was too sunny and contrasty for film. 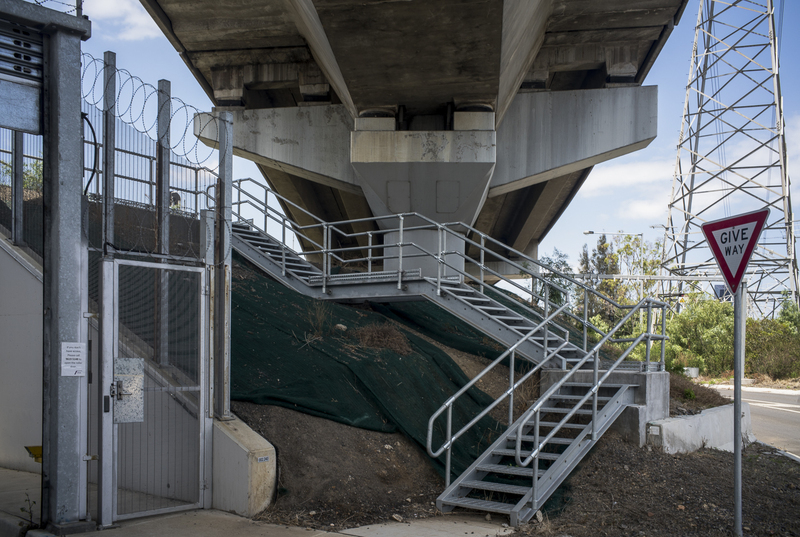 I continued walking along the Moonnee Ponds Creek Trail, crossed over a very busy Footscray Rd, and spent some time exploring under and around City Link in an area adjacent to Enterprise Road. Viewing the various images of industrial Melbourne in the initial Collaborations exhibition at Atkins Photo Lab in Adelaide opened up the theoretical project of rethinking of documentary photography to the idea that these representations are a form of industrial archaeology. 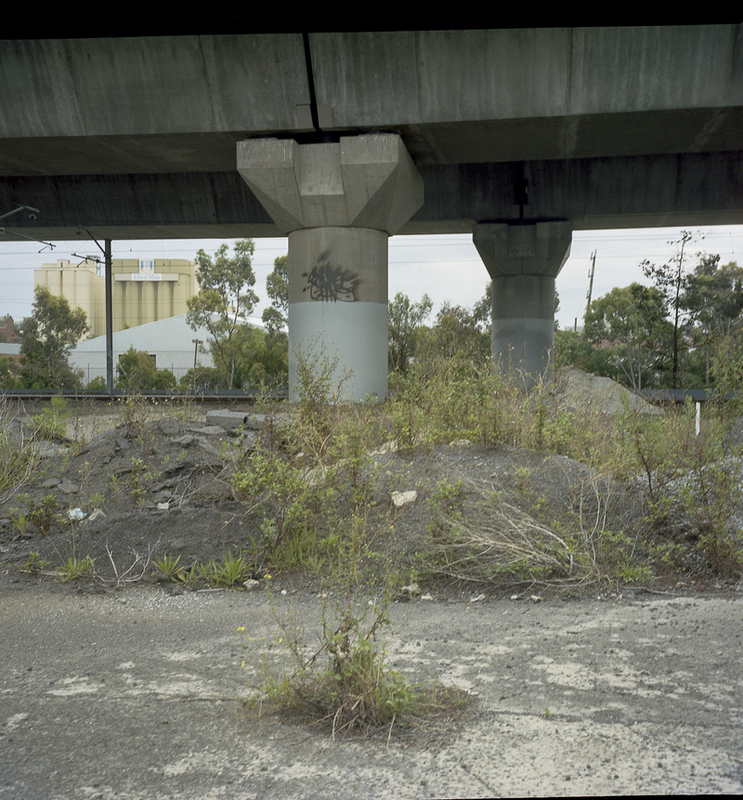 What appeared from reading these photos was a sense that the photos appeared as an excavation of a forgotten, industrial Melbourne in that they were a retrieval of what has been overlooked as the ruins, detritus or wasteland of industrial Melbourne. Though they enabled us, the viewer, to form a sense of the historical textuality of modernity these archaeological images would not be seen as art by the art institution. Today the idea of photography as a medium that simply records the world around us seem positively quaint. However, the various images on the white wall of the gallery highlighted how this large format, documentary photography also placed an emphasis on the modernist concern with the basic form of the art object -- ie., the shapes, colours and lines that make up the art work. The emphasis on the basic form of the image indicate the aesthetic aspect of this documentary style in a topographic mode. Though the pictures are a form of historical knowledge, the aesthetic dimension moves this documentary photography away from the conventional notions of mechanical representation--capturing the real. 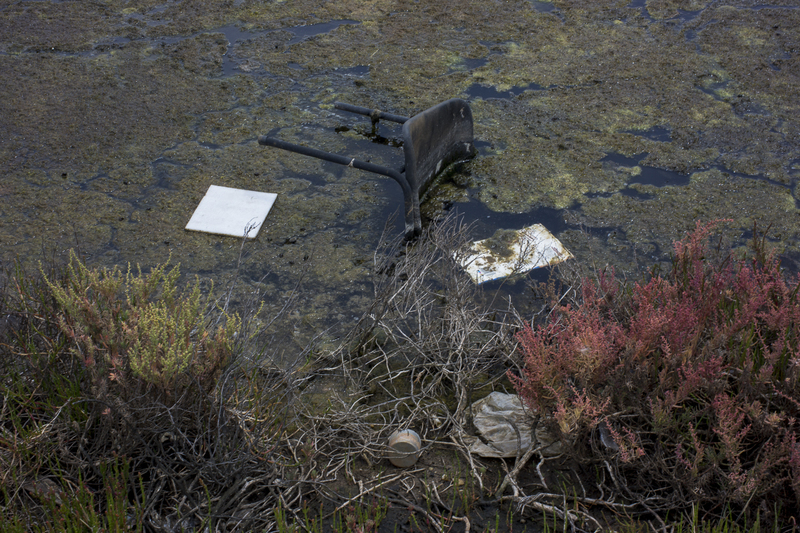 This naturalism continues to define photojournalism, the media's reportage tendency to reduce photography to illustration, and conventional understandings of documentary photography. Photographic images are anything but neutral reflections of the wider world or simple traces of a present past. In this return to the past the photos are a form of history making about the uncanny or the unhomely. The rethinking of documentary photography is also post modernist in the sense that it represents the present as if it were already past--as if it were history. The exhibition highlighted this topographical photography as a historical practice with its inbuilt tensions (or dialectic) between formalism and historicism. It indicates how this photography plays with time and historical distance, representing a moment in the past only to give it over to new interpretations and modes of seeing in subsequent viewings. Yet contemporary photography is all about,, “interrogating the medium”, which often means shifting it away from documentary towards other, more conceptually driven art forms – abstract painting, sculpture, performance, video installation in a world of of image overload. We now live in a digital world drowning in images with the arrival of the smartphone camera. The numbers are mind-boggling: 350m photographs a day uploaded on Facebook; 95m photographs and videos shared on Instagram daily. The combined number of images shared uploaded on both platforms now exceeds 290bn, while there are 188m daily active users of Snapchat. Artificial technology is just around the corner. 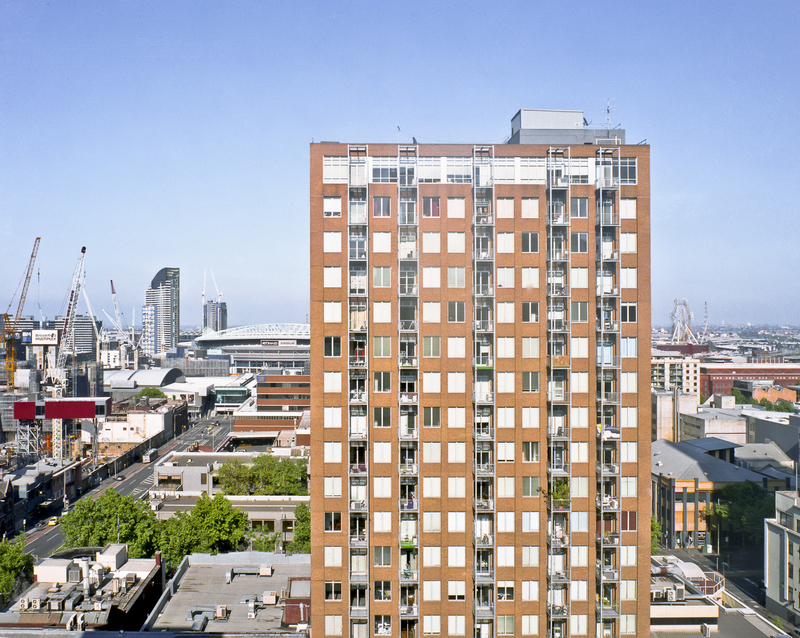 In contrast the industrial Melbourne project is very modest and slow. It works in terms of a series --bridges or freeways or creeks ---so that the images of these found object are connected to one another in an archivalist sense. Seriality can be understood in terms of difference as opposed to sameness, and photographic projects can be seen in terms of longevity as opposed to the instantaneous. As Susan James argues in her Common Ground: German Photographic Cultures Across the Iron Curtain the linking of images in a series forces the establishing of connections and relations. It bounces the gaze from one site to another, to build up meanings across time, thereby giving us a sense of our own industrial history, as well as a perspective on the spaces that we currently inhabit. The SALA Festival exhibition referred to in the previous posts of the blog (here, here, here and here) has a title. 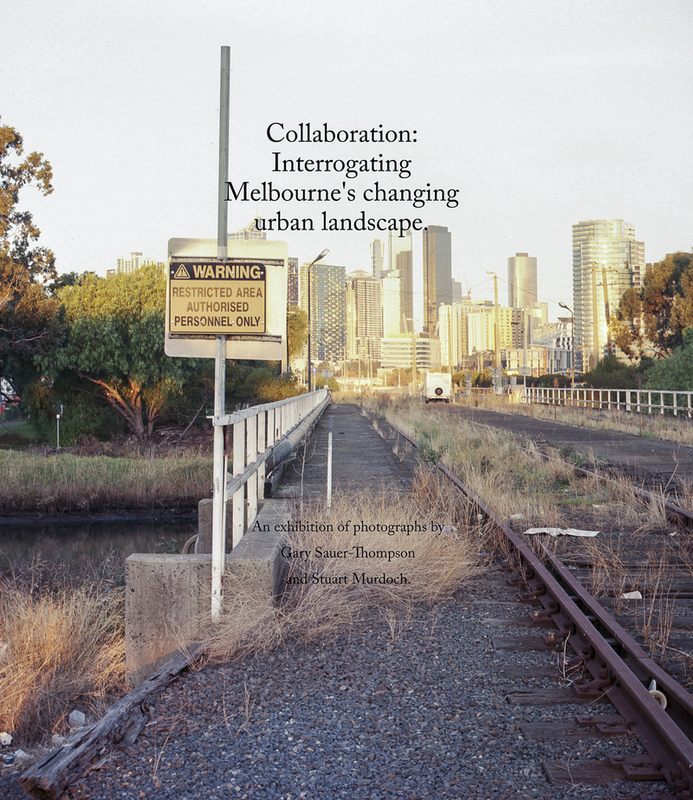 It is called Collaboration: Interrogating Melbourne's changing urban landscape and it can be seen at Atkins Photo Lab. The exhibition's opening night was August 3rd, and the exhibition runs from August 4th to September 7th during the state wide 2018 SALA festival. This exhibition is the first step in a project based on large format photography (both black and white and colour) interpreting the changing urbanscape in Melbourne's CBD, its industrial suburbs such as North Melbourne, Footscray and Sunshine, and the ever expanding western suburban edges from a topographical perspective. Paul Atkins opened the exhibition and he talked about the transformative changes in the cities that we live in. Then Stuart gave an artist talk about how he approaches his photography. Stuart highlighted how the has been working on this part of industrial Melbourne for over a decade as a film photographer, and he has an extensive archive of 5x4 black and white negatives. This archive is a form of remembering of what once was. As mentioned in this earlier post on this low key blog about documentary photography Stuart Murdoch and myself are having a collaborative exhibition at the Atkins Photo Lab for South Australia's 2018 SALA festival. 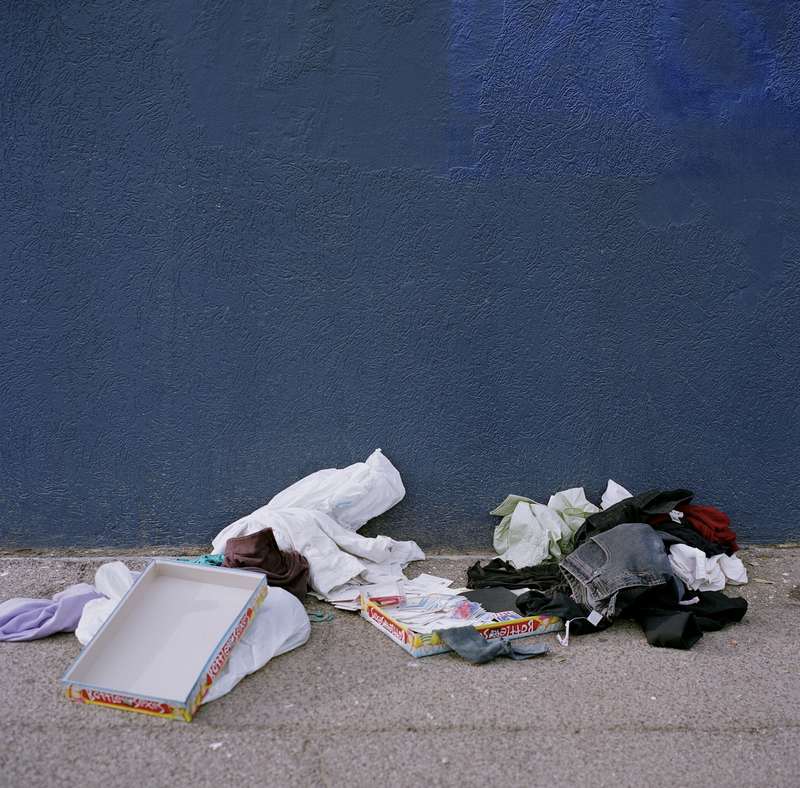 Two outtakes for the SALA exhibition from Stuart's extensive archive can be seen here on his blog. 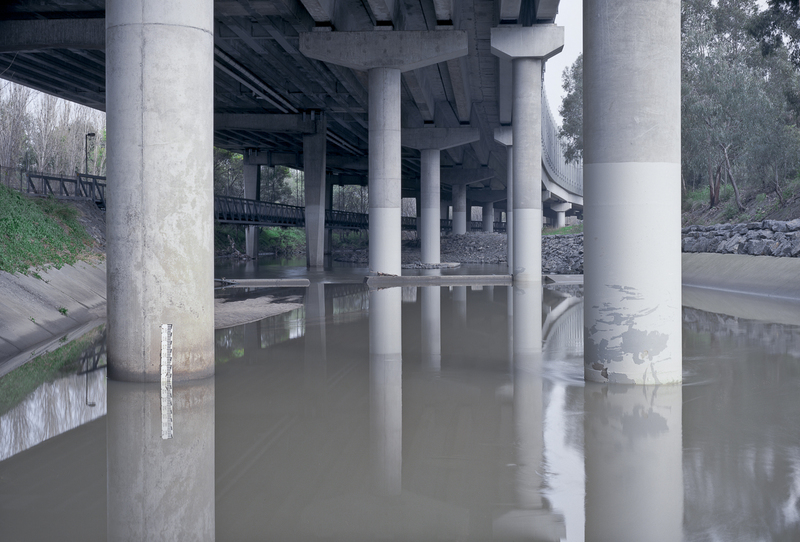 The exhibition is about an old industrial Melbourne that is rapidly disappearing in a post-industrial world. The large format black and white and colour photographs in the Collaborations exhibition are underpinned by the conceptual framework of the industrial sublime rather than the industrial picturesque. An issue that comes to the fore with presenting these photographs of the industrial sublime is: 'how can a topographical approach to photography represent the industrial sublime'? 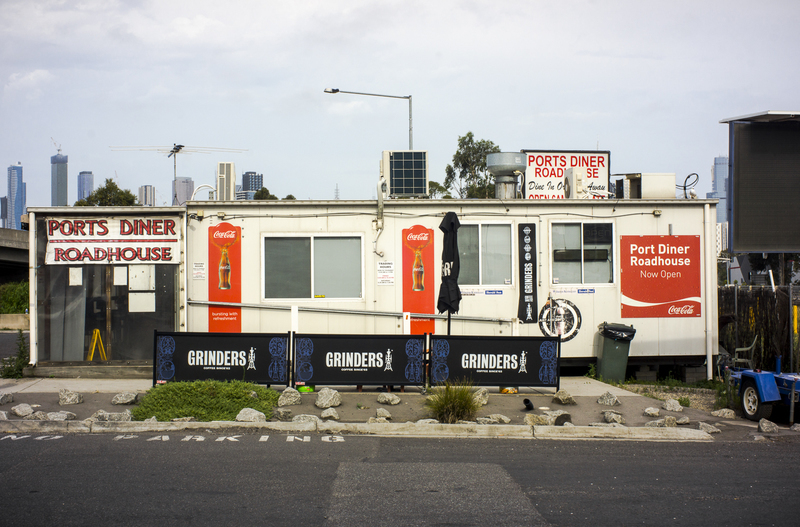 How can photography represent the whole social context of capitalism's industrial modernity in Melbourne, after the demise of the long shadow cast by Greenbergian formalist modernism? Though the sublime is a traditional category of aesthetics, it has recently seen a resurgence of interest beyond the passing whims of artistic fashion. The sublime flashes up when confronted by an experience that is immense, its scope is difficult to comprehend, and the disparities allow the emergence of new voices. The sublime indicates a breakdown and an inability to represent. 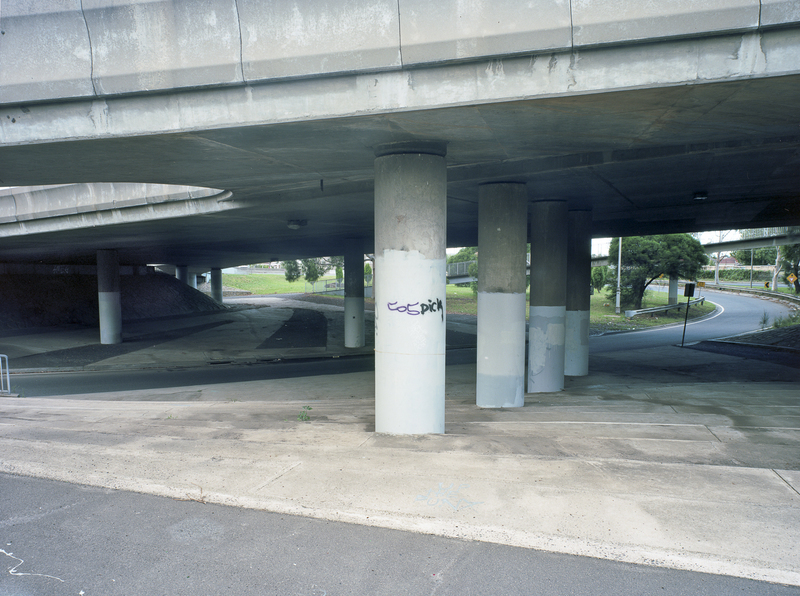 In an earlier post I mentioned that some of my documentary style photographs of industrial Melbourne would be exhibited with those by Stuart Murdoch at Atkins Photo Lab during the SALA festival in August 2018. The exhibition is about making things in the urbanscape visible, rather than a form of seeing what is already seen and noted. Photography is invested in the visible, but the making visible is the sense of making visible what is ignored or overlooked. What people are blind to. This will be the first time the Melbourne work is exhibited. I don't have that much work in the archive of the reinventing documentary project--about 40 images. This SALA exhibition requires more phototrips to Melbourne in order to build up a portfolio of the remnants of industrial Melbourne. This will be after the Mallee Routes exhibition at the Swan Hill Regional Art Gallery finishes in early May. One reason for this lack of images is that since 2012 I haven't been to Melbourne all that often to make photos. Other projects, such as the Mallee Routes one, took priority, and the Melbourne project ended up on the back burner. It required a lot of reading about Melbourne's urban development and I didn't have the time. Whilst on a trip to Melbourne in early 2018 I was able to briefly photograph around West Melbourne with Stuart Murdoch in spite of the humidity and the intense heat. I was basically using a digital camera to scope images for an exhibition with Stuart at Atkins Photo Lab in Adelaide during the SALA Festival in South Australia. This festival is around August 2018. 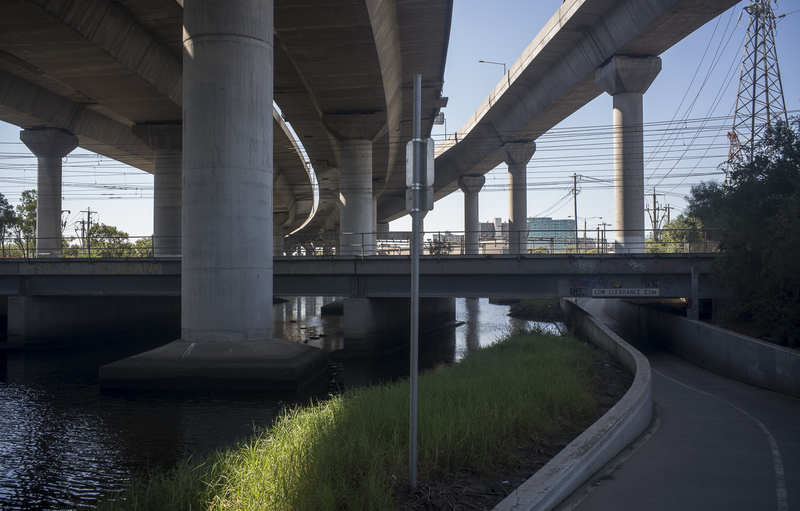 Whilst scoping the area in the railyards the will be transformed by the $11bn Metro underground railway project I recalled that I had photographed in this area of North Melbourne under the Citylink freeway and along the Moonee Ponds Creek with Stuart Murdoch. At the time I couldn't recall what year that was. I just recognised the area, remembered walking around the area, and I recalled some of the images from that documentary photography photo session. When I started to go through the archives upon my return to Adelaide I could see that I had been photographing around this area in 2012. I also realised that I didn't really know what I was trying to do with this documentary/topographic style of photography in Melbourne. I just filed it under road trips, and then forgot about it, other than conceptualising it as reinventing a documentary style of photography in the 21st century.